A couple of weeks ago, a Broadbridge Heath game was one of the match choices I gave on a Twitter poll to decide where I should go and watch a game that Saturday. While on that occasion Twitter decreed that I go and watch Bexhill vs Steyning, three different people actually contacted me directly during the duration of that poll to suggest I head to Broadbridge Heath as they are due to move into a new ground in the very near future. However, not wanting to go against the wishes of the majority (insert your own satirical voting joke here) I ultimately decided that I would indeed go to Bexhill that week, as the majority had requested, but would go to Broadbridge Heath at the next possible opportunity. 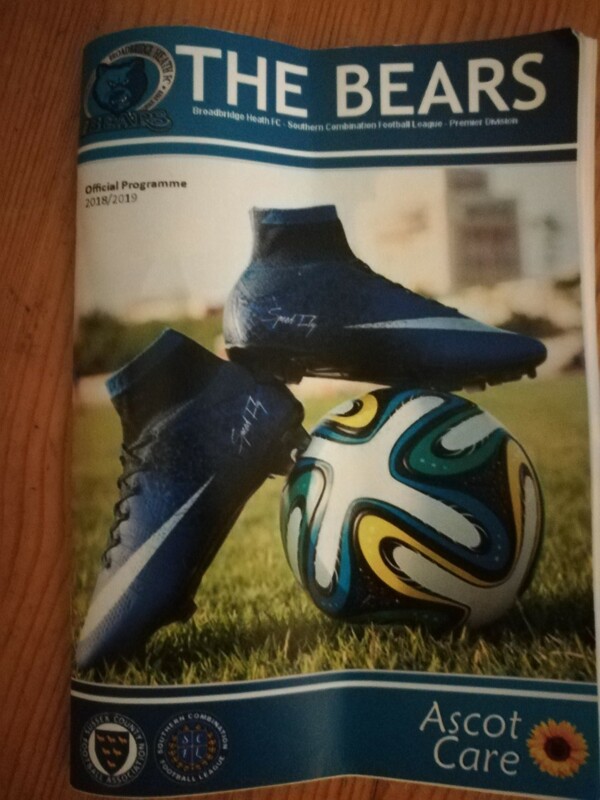 That next possible opportunity came this weekend, as The Bear’s took on Langney Wanderers (a team I was yet to see so far this season) in a SCFL Premier Division clash. 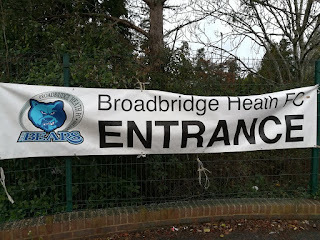 On a wet and windy afternoon, I arrived at the Broadbridge Leisure Centre with just under 20 minutes to go until kick off, and parked in the adjacent Tesco car park. This was quite a handy turn of events as wifey had asked me to pick up some milk on my way home. It's always useful being able to kill two birds with one stone (metaphorically, of course. I can categorically confirm that no birds were killed or harmed during this visit. I really don’t want any militant vegans moaning at me… again). Having paid my £6 to get in and £1 for a decent little program (from reading which I noticed Heath have a player named Alfie Jones – which, coincidently, just so happens to be the main character of a children’s book series that I write; hey it’s nearly Christmas, if I can’t plug myself now, when can I? ), I could instantly see that The Bear’s are currently in something of a state of flux. The old leisure centre is in the process of being demolished, with a newer nearby facility having recently opened. However, in circumstances that will be all too familiar to any Spurs fans reading this, through no fault of Broadbridge Heath FC, their own new ground’s facilities are as yet unready to move into (despite having been promised by the developers that they would ready by the end of October). 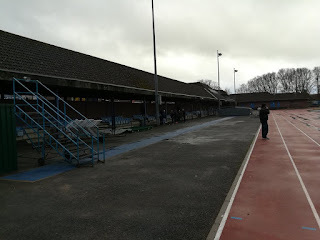 The upshot of this is that the refreshments and changing rooms are a lengthy walk away, which is great if you’re trying to getting your step count up, but not so great for the players and officials who have to trudge a fair distance before they reach the pitch. Oh well, gives them a bonus warm up/warm down, I suppose. Also not ideal is the fact that the current pitch is surrounded by an athletics track, which means that on wet days like today, the fans who shelter under the main stand which runs along the width of one side of the pitch, are quite a distance from the action. Should have brought my glasses with me for this one! The constant drone and banging of the construction site located immediately behind the stand was also quite annoying, but I’m sure all of these little grievances will be fully forgotten once the new ground is finally ready to move into. 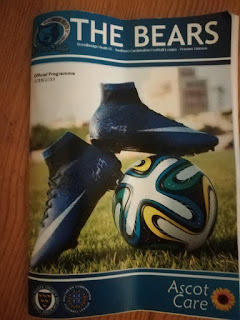 From the little I saw of the new facilities whilst trekking to the leisure centre for a half-time cup of coffee, once eventually completed The Bears will have a ground to rival the best at this level in Sussex. I’ll definitely be back to check out the new ground before the end of the season (providing it's ready, of course). The match itself was over as a contest at half-time. Although for much of the first-half there was no suggestion that this would be the case. 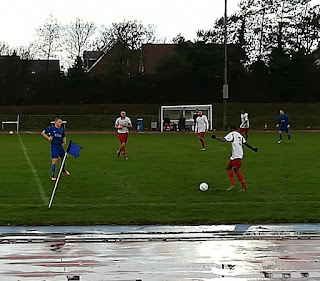 After a fairly even opening 20 minutes, as players from both teams struggled to get to grips with the heavy pitch and swirling winds, The Bears began to take control and had a couple of sighters at goal. 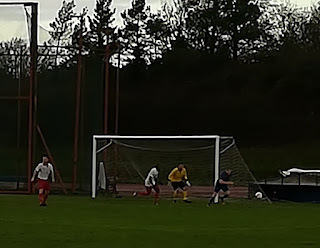 They deservedly took the lead just after the 25-minute mark when the impressive Lee Carney, who I felt was the game’s stand out player, beat the offside trap and finished well past Dan Hutchins in the Langney goal. 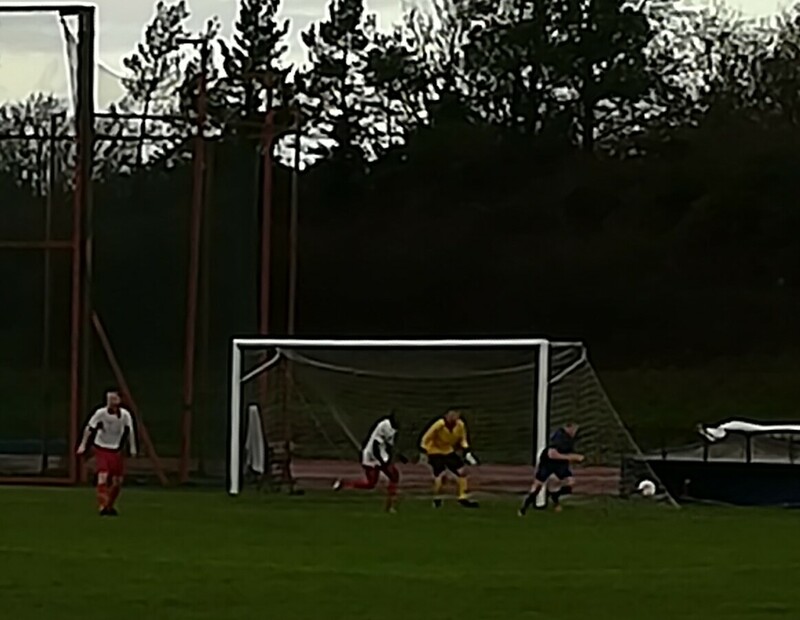 They then doubled the lead around ten minutes later, when Ryan Brackpool rose above Tariq Straker at the near post and squeezed his header into the next. While The Bears were on top and fully deserving of a two-goal lead, Wanderers did pose an intermittent threat, with Max Hollobone and Evan Archibald looking the best hope of the visitor’s finding a route back into the game. Having seen Broadbridge Heath throw away a two-goal lead earlier in the season away at Saltdean, I was only too aware that if the Wanderers could nick a goal, then it was very much game on. 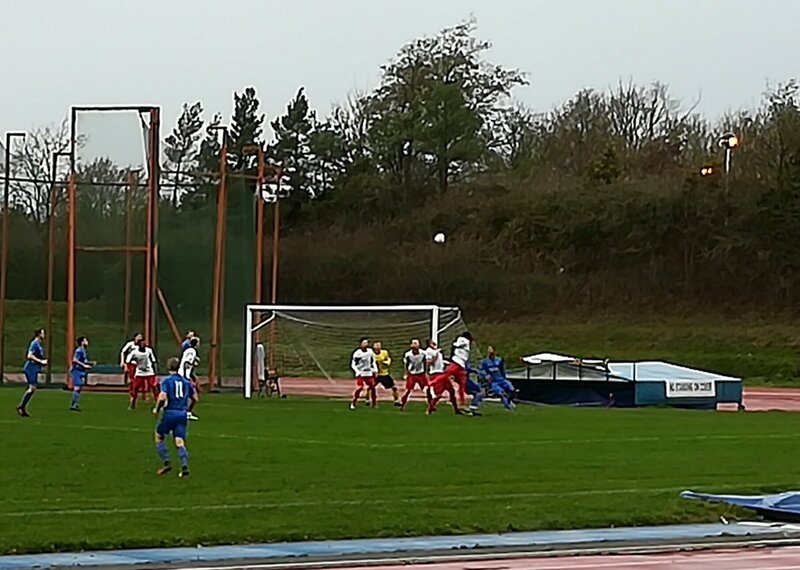 Then, with half-time approaching it all went wrong for Langney. First Ryan Alexander was shown a straight red for a slightly late tackle on Richard Wetton. Without going all Arsene Wenger, I didn’t have a clear view of the incident (as previously mentioned, I was a fair distance away from the pitch and without my glasses) but along with the majority of the spectators I felt the challenge merited nothing more than a yellow card – although it has to be said I’ve also seen reds given for far less. The wet pitch, the reaction of Wetton (who was undoubtedly hurt but did seem to recover pretty quickly once the red was shown) and the fact that the referee had only just spoken at length to Alexander, who seemed to be extremely aggrieved about something that had happened in the build up to the second goal, all undoubtedly went against him. To make matters worse, moments later, Langney right-back Corey Haywood-Roye looked to be caught late after trying to recover his own heavy touch. The ref waved play on, and with Haywood Roye lying prone on the ground and in some obvious discomfort, the hosts took full advantage. A long-range curler came back off the bar, and despite the Wanderer’s defence having two chances to get the ball away, Wetton – to the annoyance of the visiting players and fans – poked in the third. The referee promptly blew for half-time with Haywood-Roye still on the ground, and it was obvious that the Langney player wouldn’t be returning for the second half. Hope he’s okay, by the way. With the visitors having already used their only sub, this meant the Wanderers would be down to nine-men for the second-half. As I said above, game Over. To their credit, the Wanderers didn’t wilt in the second half, and while Broadbridge certainly created a plethora of chances, Langney never let their heads drop and did look to go forward when possible. It certainly wasn’t a case of just putting everyone behind the ball and defending for their lives. The Bears didn’t add a fourth until 20 minutes into the second half when Tom Howard-Bold got himself onto the scoresheet. Two minutes later, Wetton grabbed his second with the goal of the game, a fine solo effort, and when George Cousins added a sixth a few minutes later, I honestly thought a double figure tonking could be on the cards. Once again, though, Langney didn’t lie down and thanks to a combination of some dogged defending and lacklustre finishing, no further goals were added. With just a couple of minutes remaining, Langney’s obvious sense of injustice was enhanced when one of their players seemed to be pulled back by a defender while racing through on goal, only for the ref to once again wave play on. 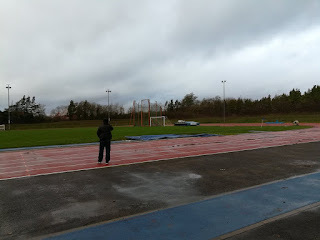 Athletics track or not, it was clear to hear what the Langney manager thought about this decision even from where I was standing. Soon afterwards the ref blew for half-time, and I made my merry way to Tesco to buy some milk (being super careful to avoid any awkward confrontations with our feathered friends along the way).